One hundred copies printed on Zerkall paper, bound in quarter leather and paper covered boards, and housed in a clamshell box. 10 x 14 inches, 60 pages (printed on recto only). 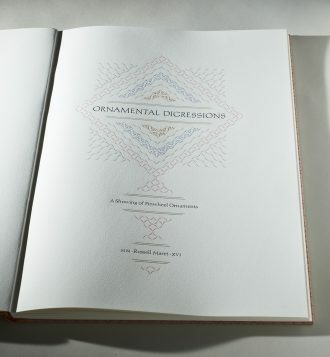 The book that has developed, Ornamental Digressions, draws on all of these various sources. It begins with four black and gray designs that display the basic functions of the ornaments. This is followed by fifteen ornamental digressions, each of which is paired with a text and printed in a wide array of colors. The book ends with notes on the sources of the fifteen digressions. 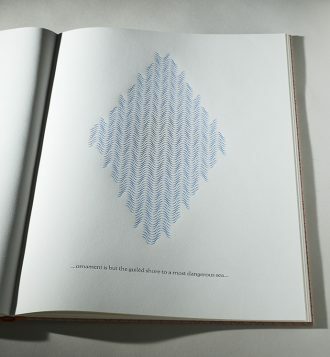 Additionally, twenty deluxe copies are accompanied by a swatch book of twenty patterned papers that are printed on variously colored handmade paper.